The Himalayan Kingdom has the richest and most diverse culture landscapes anywhere. Nepal is the holy land of Lord Pashupatinath and Gautam Buddha where the Hindus and Buddhists have lived together in harmony for centuries. The Temple of Pashupatinath is Nepal's most scared Hindu shrine and one of the four most important cities in the world for Shiva worshippers. Lord Buddha, the light of Asia, was born in Lumbini in Nepal/s southern plains, which makes Nepal a scared pilgrimage destination for Buddhists as well. Nepal has been the dreamland of the tourists for a long time. 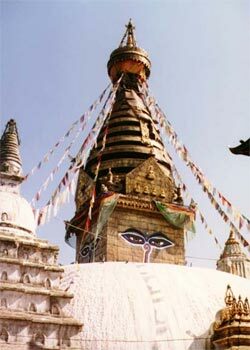 Nepal invites, welcomes, charms and bewilders the visitor. Those who have already visited Nepal cherish the desire for a second visit and those who have heard or read about the kingdom make a plan to visit the country. The pattern of religion gives the country a unique status in the world. Almost all the important religious sects of the world are found in Nepal, however, the majority of the population believes in Hinduism and the conglomeration of the two religions, Hinduism and Buddhism serve as an unique example of tolerance and brotherhood. Many festivals of religious significance are celebrated commonly with equal enthusiasm by both the sects and there is the co-existence of all the other religious.